Heather’s plentiful flowers form magnificent carpets of purple across swathes of moorland and the steep hillsides of our valleys. 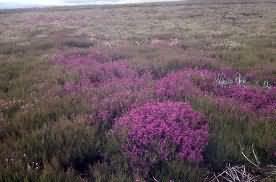 There are a dozen or more varieties of Heather growing in Europe, but the most common here is ling. Ling derives from either the old Norse ‘Lyng’ or from the Anglo-Saxon ‘Lig’, meaning a fire. Cut, dried and stored, heather still provides fuel today for heating and cooking in remote areas. The predominance of this heather in our landscape is to a large extent a human-created condition that has resulted from the removal of trees. Following deforestation, the subsequent management of the land, by grazing with sheep or cattle and burning (to maintain moorland for grouse shooting) has prevented the return of the forest and aided the proliferation of heather. The plant is so tough and has such strong regenerative powers that it can easily survive fires, putting up plentiful new shoots to provide food for grouse and livestock. Ling’s Latin name is Calluna vulgaris, from the greek kalluna, to cleanse. This may refer to its pleasant cleansing taste or to its use as a broom. As well as brooms, it has been made into mats, baskets, brushes, mattresses, rope, and used as a dye (the flowers give wool an orange-yellow colour). Due to its toughness, availability and durability, heather has been used to make tracks and roads, fences and field drains. It has also provided an important building material for walls, thatching, and its roots have been made into pegs and nails. Some of these uses still persist or are being re-introduced. In Scotland, especially in the Highlands, heather is an iconic plant. The roots are carved into knife handles, particularly for ceremonial Scottish dirks. It was used as a plant emblem and worn by various clans for decorative and symbolic effect. Heather ale has been, and continues to be, an important national drink. Its manufacture goes back to the times of the Picts and beyond, there being evidence of a drink made from fermented heather found on a pottery shard from a Neolithic site on Rum. Heather is traditionally associated with good fortune and protection, white heather is thought to be particularly lucky and sprigs of it are woven into bridal bouquets and sold as a lucky charm. Heather seems to me to be generous, connective and caring in its nature, as it nurtures, protects and feeds so many different creatures. It is an ecological marvel in its own right. Not only does it provides food for many animals but it also provides a natural habitat, shelter and nesting sites for numerous insects, birds and other animals all of whom are interdependent on one another. One of the reasons for its success as a species, and another connective aspect, is its mutually beneficial relationship with a fungus (Rhizoscyphus ericae). The fungus wraps itself around and penetrates the roots, providing minerals and water that it extracts from the soil while in return heather provides the fungus with sugars from the photosynthesis of its leaves. Heather has also provided us humans with its loving care. It is not much in use today in herbal medicine, except perhaps among Scottish herbalists, but it probably merits greater attention. There is evidence of quite extensive use in the past going back to the Middle Ages at least. Modern usage mainly centres on its diuretic and antiseptic properties and it is used to treat urinary tract infections such as cystitis. It rids the body of excess uric acid that has resulted in kidney stones or the aching joints of arthritis. 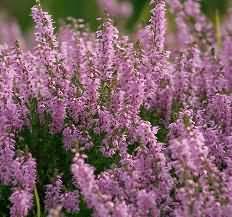 The famous French herbalist Messegue tells of how he cured a man crippled with rheumatism, by instructing him to take two baths of heather a day for three weeks. In the Highlands an ointment is made from heather tops and in mountainous areas of Europe a liniment is made for arthritis ad rheumatism by soaking the tops in alcohol. Heather tops make a pleasant tea, which is mildly sedative and said to help depression, insomnia and nervous exhaustion. Use 2-3 teaspoons of fresh flowers to a cup of boiling water and infuse for about five minutes. A heather bath would no doubt also help these conditions, as well as helping joint problems. Gather a small armful of heather, place in a big pan and cover with boiling water for a few hours, and then strain it into the bath. To dry heather for tea later in the year, cut spikes of flowers while they are still in bud or just open, and hang them to dry in small bunches out of direct sunlight.